Religion and religio-political forces have become potent influences in the domestic politics of many countries irrespective of geographical location, stages of economic growth, and systems of governance. The growing importance of religion as a marker of identity and a tool of political mobilization is reshaping the political landscape in an unprecedented manner, and South Asia, which contains the world's largest populations of Muslims and Hindus with significant number of Buddhists, is no exception to this fact. 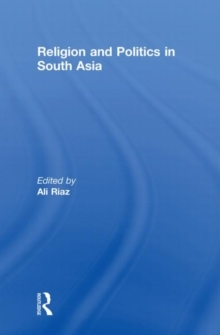 This book presents a comprehensive analysis of the interaction of religion and politics in Afghanistan, Bangladesh, India, Nepal, Pakistan and Sri Lanka. Although the specific circumstances of each country are different, in recent decades, religion, religio-political parties, and religious rhetoric have become dominant features of the political scenes in all six countries. The contributors offer a thorough examination of these developments by presenting each country's political system and the socio-economic environment within which the interactions are taking place. The analysis of the various factors influencing the process of the interactions between religion and politics, and their impact on the lives of the people of the region and global politics constitute the core of the chapters.